For nearly a century now, Daikin has been one of the world’s most outstanding manufacturers of HVAC equipment, especially in the areas of heating, cooling, and refrigerant products. 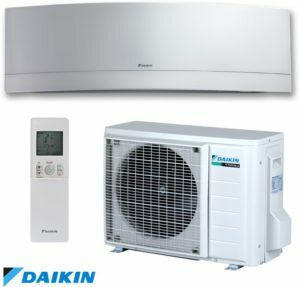 During those nearly 100 years of continuous research and development, Daikin has become one of the foremost leaders of cutting-edge technology in HVAC equipment, and a recognized provider of outstanding quality in all its products. All those years of expertise and forward-thinking design ideas have now come to fruition in the form of the Daikin Emura ductless air conditioning system. One of the less desirable traits about traditional air conditioners is that they have such a big footprint, and are such a prominent part of the interior landscape of any home or workplace. Room conditioning units need to be placed in windows so there can be a ready exchange of conditioned and non-conditioned air, and they can be a somewhat intrusive presence in any room where they’ve been installed. Central air conditioning, on the other hand, may have its biggest component established outdoors, but still, requires ductwork throughout the interior in order to disperse conditioned air to each room being serviced. The Daikin Emura ductless system overcomes both these drawbacks in a modern, very appealing way that adds value to a room rather than detracts from its appearance. The slender curved profile of the Emura placed high up on the wall, is almost like a designer piece added to any room instead of a big, bulky machine that mars the interior decoration scheme. Available in either a silver or soft white matte color, it can blend in with your existing decor easily, and when closely observed, its modern design will enhance the impression of contemporary living that you’ve cultivated. Adding to the whole understated presence is its near-silent operation, at a mere 19 decibels. Efficiency has been taken to a whole new level by the Daikin Emura ductless air conditioning system, as evidenced by its wide range of temperature controls: it can cool rooms anywhere from 14 to 115 degrees Fahrenheit, and it can heat them from -13 to 75 degrees Fahrenheit. Its SEER rating is 18.9, which puts it at the high end of seasonal energy efficiency rankings, and its HSPF rating is 12.5, which ranks it just as highly among heating season performance factors. It is remotely controlled by a wireless controller and managed by the Daikin Comfort Control App, so that the perfect environment is made available with effortless fingertip management. Even the air filters are the ultimate in filtration design, making use of titanium apatite photocatalytic technology, for eliminating all kinds of debris and allergens from indoor air to increase the comfort level for household members. Up to eight, heating/cooling zones can be setup within the home for air conditioning by the incredible Daikin Emura ductless system.